Another Irish trip into the golden nectar for Paul, with homage to John Teeling. Is it Whisky or Whiskey? The difference between the two is the spelling of whisky. Scotch whisky is spelt without the E, Irish Whiskey is spelt with an E. Och, it goes back a long way to when the Irish wanted to be different from the Scots. 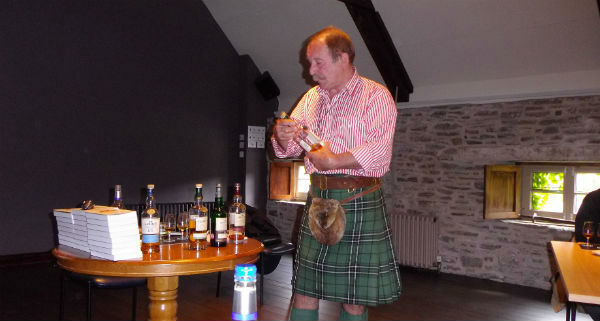 Whisky is the anglicised version of the Gaelic – uisge beatha (pronounced “oosh-ki-bah”). Gaelic is native to both Ireland and Scotland. As well as spelling, there are big differences in how whisky is produced in Ireland and Scotland. Scotch is made from malted barley, and other grains, in a copper pot still and matured for a minimum of three years and one day (leap year folks!). Irish Whiskey is made from unmalted barley and other grains, in a copper pot still and matured for a minimum of three years. Scotch is usually distilled twice (but there are distilleries not adhering to this – Mortlach and Springbank are just two) and made completely from malted barley. Single malt and blends are popular and made from a mixture of malted grains. Beware of the David Beckham slosh! Irish on the other hand, is mostly triple distilled, which makes its’ smoothness. It is also more likely to be made up of a combination of grains, not just barley. The extra distillation has the biggest effect on the difference between the flavours of Scotch and Irish Whiskey. It gives Irish whiskey a lighter flavour, and feel smoother. There are exceptions, such as Auchentoshan (Scotland) using triple distillation and Kilbeggan (Ireland) having double distillation. Single Pot Still, made from malted and unmalted barley grew out of using unmalted barley, as malted barley was taxed in Ireland. Still with me? Whiskey expert Mr John Teeling (whom I met a wee while ago and toured his distillery) warned that there may be a shortage of Irish spirit in the next few years, due to surging global demand. Mr Teeling, said “the Japanese market is already experiencing similar problems due to the popularity of its’ product. Soon there will be a shortage of Irish whiskey” Mr Teeling (72) told The Irish Times. “What we are making now, you won’t sell for seven years. So we will have a shortage if the rate of growth continues at a cumulative rate over the next six or seven years.” Mr Teeling, who sold Cooley Distillery to Japanese drinks group Suntory for €73 million in 2012, said Suntory is withdrawing its Hakushu 12-year and Hibiki 17-year single-malts because they have no whiskey left. Suntory’s chief executive Takeshi Ninami has said it could take up to a decade for Japanese whiskey distilleries to meet demand from consumers and retailers. Watch out Scotland, we all know there is a worldwide whisky boom! John Teeling built the Great Northern Distillery (GND) at the old Harp Brewery in the border town of Dundalk to supply bulk malt and grain whiskey to new brands on the Irish market. Meanwhile, his two sons set up Dublin’s first new distillery in a century in the Liberties in Dublin – Teelings. GND is fully operational and has the capacity to distil the equivalent of 42 million bottles of whiskey per year. “Great Northern is successful because the market is growing so strong,” he added. “But there is no aged malt in Ireland. It’s all gone and all the Cooley-aged malt that Suntory bought and sold for even higher prices is gone.” The Town of Dundalk has always been ideally suited to foster a distilling industry with access the purest water from the nearby Cooley Mountains. The Dundalk Distillery operated in the Town between 1708 and 1926. Two of the distillery buildings, the grain store and maltings, still exist and now house the County Museum and Dundalk Library. The Great Northern founded on the site of the former Great Northern Brewery. The original brewery was in 1896. Diageo’s association with brewing in Dundalk dates back to the late 1950s when until 1960, the brewery had produced stout and ale. 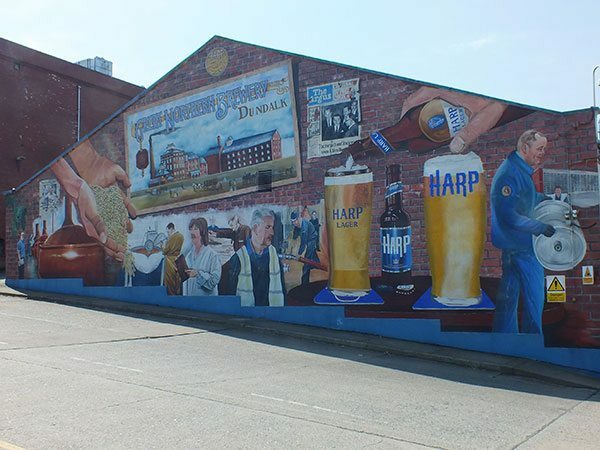 However, an increased demand for lager, Guinness converted the brewery into a modern lager operation which seaw Harp Lager (Irish harp obviously) created. 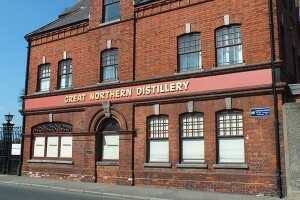 The Great Northern Brewery was the second largest brewery in Ireland until its closure in 2013 and then taken over in 2015 by the Great Northern Distillery. Great Northern Irish Single malt whiskey spirit is a made using 100% malted barley. There are variations in malt production can produce a double distilled Irish malt product or an Irish peated/turf malt also. The Irish malt spirit is reduced to customer specifications which has a typical casking A.B.V. of 63%. I was told when there, they have no warehouses, but sold all new spirit right away. GND Irish Pot Still whiskey Spirit uses a blend of malted and unmalted barley, the unmalted barley is essential to pot still whiskey as it gives the distinct spicy flavour to the whiskey. As required under the Geographical Indication for Irish pot still whiskey minimum of 30% unmalted barely and malted barley is used in the mash and distilled in copper pots. The Irish pot still spirit is reduced to customer specifications which has a typical casking A.B.V. of 63%. GND Irish Grain Whiskey Spirit uses maize with a small percentage of malted barley in the mash. The grain spirit is triple distilled in columns as opposed to copper pots. The Irish grain spirit is reduced to customer specifications which has a typical casking A.B.V. of 68.5%. Meanwhile, their Great Poitín is made of a blend of both new make Irish Single malt whiskey spirit. Burke’s Irish Whiskey During 2017, Great Northern Distillery released the first product offering under the historical ‘Burke’s Irish Whiskey’ brand. These were 5 casks of a 14/15 year old single malt bottled at cask strength. These are presently available from celticwhiskeyshop.com and Callan’s Off License Dundalk. Am out of breath now, time to relax with Burke!